This is a perfect travel soap. The natural low-profile jar has a tight-fitting lid so there is no worries about coming apart in a suitcase. To a large measuring cup, add 32 oz. cut up Shea Butter Soap and heat in microwave until melted. Add 0.95 oz. Fragrance Oil and 0.15 oz.Preservative to melted soap. Fill small measuring cup halfway with melted soap. Add 2 oz. Kaolin Clay and blend until smooth using mini mixer. Pour back into remaining melted soap and stir. Fill each jar to 5.50 oz. by weight. Spritz tops with rubbing alcohol and allow to harden. Repeat steps 1 - 4 to make additional six jars. Once soap has hardened, place lids on jars. To Use: Add some water into jar of soap. With a shaving brush, swirl around to make lather. Apply to face and carefully shave. Ingredient Label: Glycerin, Propylene Glycol, Water, Sodium Cocoate, Sodium Stearate, Sorbitol, Kaolin Clay, Sodium Myristate, Shea Butter, Titanium Dioxide, Fragrance, Diazolidinyl Urea, Methylparaben, Propylparaben. "Can these be made using a tin can with a screw on top instead of the plastic jar? " Staff Answer Since the soap contains water, it will most likely rust the can unless it has a coated lining. "May I substitute Detergent Free Three Butter Melt and Pour Soap Base instead of the DF Shea Melt and Pour soap base?" Staff Answer Yes, you can make this substitution. If labeling, be sure to adjust the ingredient listing. "May I substitute kaolin clay instead of the bentonite clay for this recipe?" Staff Answer You can. 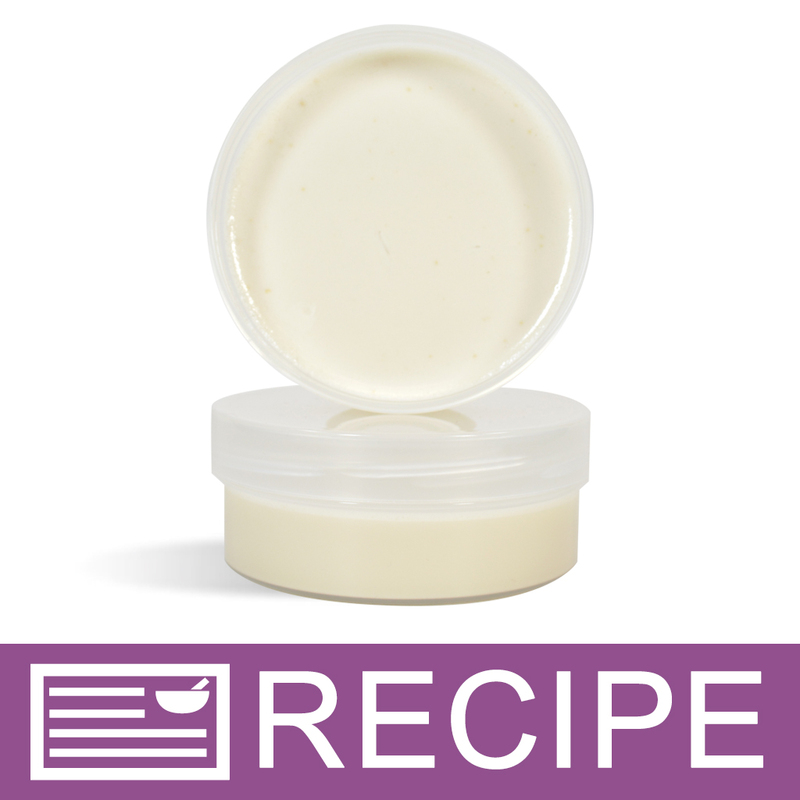 The recipe originally had kaolin clay but we have been unable to find a reputable source for this so we had to change some of our recipes and substitute bentonite clay. "Can you do a cold process and pour it directly into these jars?" Staff Answer This container is made of PET plastic. We suggest only pouring directly into the container if your soap stays under 140º F. This will prevent warping. "Could this be made as a bar instead of in a jar? Thank you, Lynda"
Staff Answer Yes, this will pour and harden so you could pour your shave soap into a soap mold and sell it in that form. "Can you use Optiphen Plus instead of the preservative shown? I would like to offer something paraben free." Staff Answer Yes you can. Just be sure to check the recommended usage rates for Optiphen Plus as it may be different than the Germaben II. "Why do you put a preservative? Doesn't melt and poor hold up with out one? " Staff Answer Because this soap is stored in a plastic jar there is a high risk that water will be introduced to the soap and may not dry out before the jar is closed and stored again. Therefore we opted to add an additional preservative to prevent the growth of bacteria due to this possible contamination.